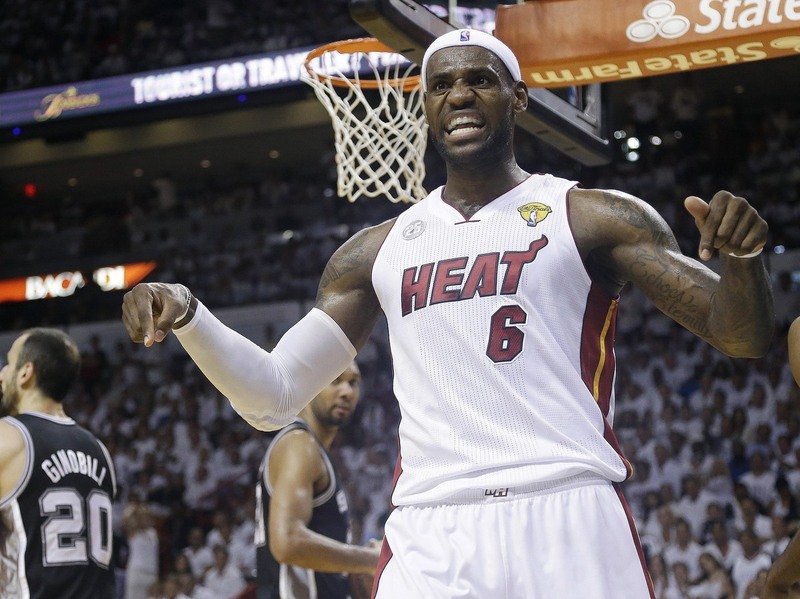 Could LeBron And RGIII Help Sell The Affordable Care Act? : Shots - Health News Massachusetts got young men to sign up for health insurance by enlisting the Boston Red Sox. Now HHS is angling to repeat that success by getting NFL and NBA stars to help promote federal health insurance exchanges. And if that doesn't work, they might recruit Mom. 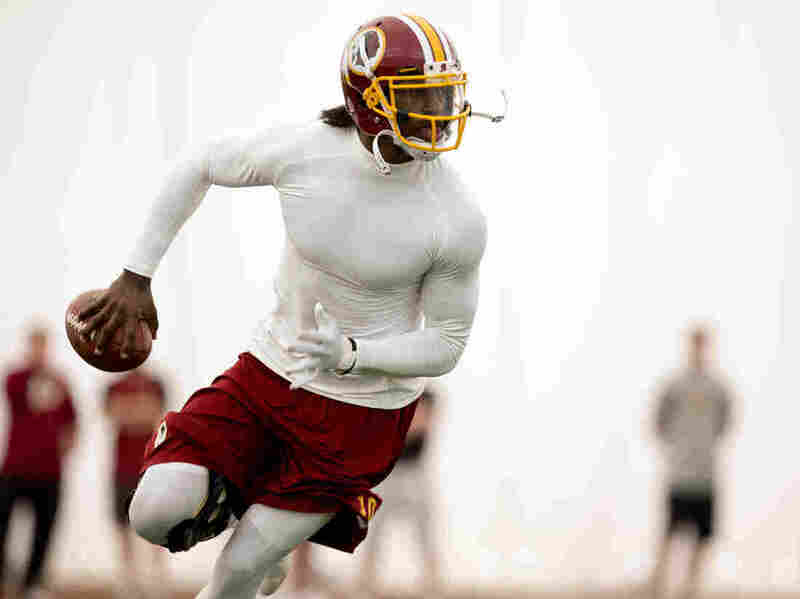 Washington Redskins quarterback Robert Griffin III already promotes Subway sandwiches. Will health insurance be next? Who's going to be more successful at selling health insurance to young men this fall: NBA MVP LeBron James, NFL rookie of the year Robert Griffin III, or Mom? If officials at the Department of Health and Human Services get their way, all may be drafted. "We're having discussions, active discussions, with a variety of sports affiliates," Health and Human Services Secretary Kathleen Sebelius confirmed at a meeting with reporters this morning to relaunch the department's website for consumers, HealthCare.gov. The NBA season matches the enrollment period for insurance through federal health exchanges. "We know the Red Sox were incredibly effective in Massachusetts when they rolled out their marketplace," Sebelius said, referring to that state's successful effort to market to young men when it was implementing its insurance mandate in 2007. "So it's a logical place to go." Last week there were unconfirmed news reports of discussions between HHS and the NBA, whose season runs pretty much concurrently with the six-month sign-up period for the health law. But it's football season that will be in full swing when open enrollment for coverage through the Affordable Care Act launches Oct. 1. Sebelius hinted today that the National Football League may be more than willing to take on the task. "The NFL," she said, "in the conversations I've had, has been very actively and enthusiastically engaged, because they see health promotion as one of the things that's good for them and good for the country." Getting young people, particularly young men, to sign up for coverage under the health care law is not just something that's good for them, however. It's critical to the entire success of the new insurance exchanges created by the Affordable Care Act. If only the older and sicker sign up, premiums will quickly become unaffordable. If using sports stars doesn't work, maybe HHS will turn to Mom to get young men to sign up for health insurance. Yet getting those young people to sign up is a challenge, said Sebelius, since they "may not get up every morning thinking about health insurance." Enter Mom. It turns out that mothers, even more than sports stars or celebrities, have a profound influence on what even their grown sons do. Remember all those Campbell's Soup-NFL ads? It turns out, says Sebelius, that those ads have something of a ring of truth. She said she was recently talking with an NFL player representative, and he told her that when it comes to the health insurance offered by the NFL, "the most influential person is the mother of the player, who can often get the player to do things that a wife, a spouse, a girlfriend, or the player himself doesn't do." Added Sebelius, herself the mother of two sons: "It kind of confirmed my basic bias that moms still have a lotta influence."